Being grateful. – My Life. So Far. Last night’s Bellies of the Caribbean show was tremendous! So many great performances, costumes, and dancers! The night was simply magical. A huge thank you to Bedouin Beats and all the instructors and dancers that worked so hard to put the evening together. Performing with the intermediate ATS girls was a tad nerve wrecking as the Three Eyes Tribal ladies are in the class and are on a whole other level of fantastic! But I think I kept up pretty well. TriDevi’s pirate number was so much fun to perform! We’ve been practicing it forever and worked really hard to ham it up and make it pirate-y! The audience seemed to like it and we got TONS of really positive feedback. I’m super happy with that performance as I think it’s our best one yet! But then again, the best is always yet to come. On to the next! 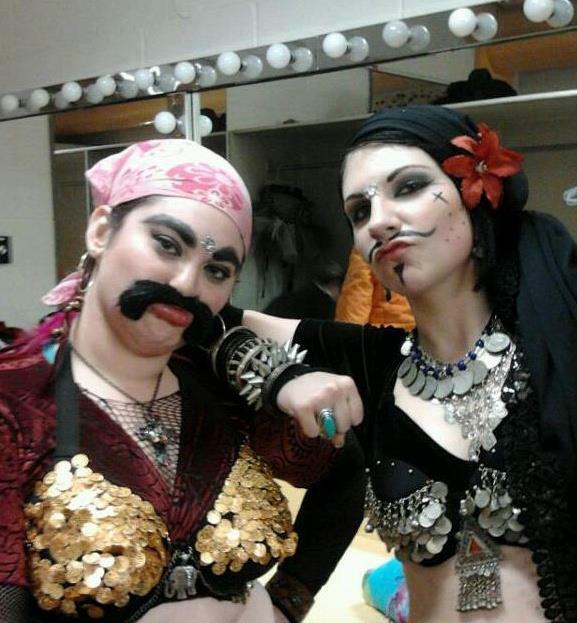 This is me and fellow dancer Tabitha in all our piratey goodness! YARRR! What will we come up with for the next show? You’ll just have to stay tuned! As soon as I get a video of the performance, I’ll be sure to post it! Right now, I can’t seem to get dance off of my brain. I should be working on my homework. The due date looms ever nearer, yet I can’t seem to focus on getting it done. My mind is all over the place with dancing and glittering, shiny goodness. Ah! I guess this is what passion is! Even though life threw a lemon at me the other day, I didn’t dwell on it for too long. Or I tried not to. I now have a confirmation of what’s going on with me and can move forward. There is much to be thankful for in my life. The list truly is too long to go over and I wouldn’t want to forget anyone! Just know that if you are present in my life, I am grateful for you! Next postInspiration Before My Expiration!